Who says there’s no abundance of green spaces here in Dubai? When people think of dubai, there are a few images that come up instantly. The silhouette of the Burj Al Arab with the sea lapping gently around it at sunset. Sunlight reflecting off the Burj Khalifa’s glittering facade on a bright summer morning. The spires of the Atlantis looming at the apex of Palm Jumeirah. The city is strongly associated with its architectural prowess and the man-made marvels that have been constructed over the past decade. There is another side to the city, however, that is often overlooked, and one that is becoming more and more prevalent in newer developments. I am referring to Dubai’s parks, lakes and green spaces. Longtime residents will no doubt have spent a weekend or two at Safa Park, one of the most popular outdoor destinations of its time. More recently, we have seen the addition of spaces such as Zabeel Park, the Burj Park in Downtown and Dubai Miracle Garden. Then there is Al Barari, an entire community devoted almost exclusively to greenery and thoughtfully designed waterways. This year, we will be seeing a fantastic new addition to the roster – Dubai Hills Park in Dubai Hills Estate. Set to open in April, the park will be larger in overall area than both Zabeel Park and Safa Park, measuring an immense 114 hectares (1.14 sqkm). It will no doubt become a major attraction for people from all parts of the city as they attempt to catch the last few days of the spring weather. Even in summer, I imagine a few brave souls will steel themselves against the sweltering heat to take a short stroll along the park’s tree-lined trails or to relax under shaded pavilions. Dubai Hills Park will be opening its gates less than six months after the opening of Dubai Hills Golf Club, another massive area spanning 1.2 sqkm. Both of these are significant because of what they represent, not just in terms of the ongoing development of Dubai Hills, but in terms of Dubai’s future as a green city. While there is no shortage of visually stunning individual projects, from the majestic Ain Dubai to the striking Royal Atlantis Residences, there is a greater focus on building communities where families can live and grow amidst natural surroundings. The trend, if one can really call it that, took off in the early-2000 when Dubai, known the world over for its tourist attractions, started to rebrand itself as a long-term residential destination. This led to the rise of the master planned community, a concept that was previously unheard of in Dubai. Arabian Ranches and Emirates Living were the forerunners, creating neighbourhoods that offer a way and pace of life far removed from what you would find on the city’s busy streets. For me, this is a welcome change as I can spend my workday in the thriving urban district of Business Bay, then come home to the tranquility of Jumeirah Golf Estates, swapping out skyscrapers for greener vistas. 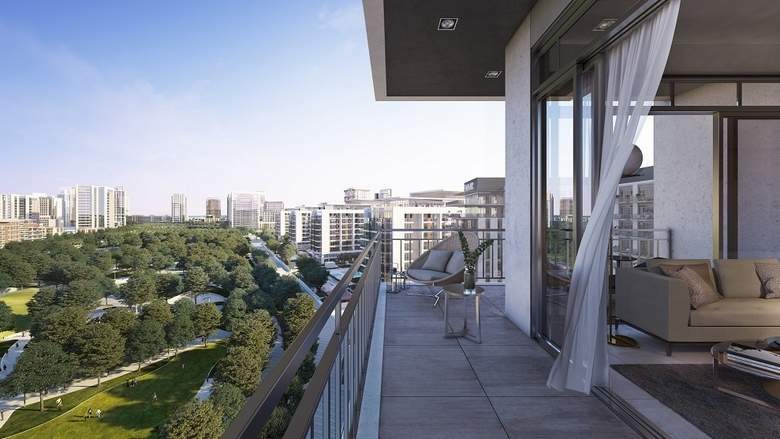 Similarly, each new community that is being developed, from Dubai Hills to Tilal Al Ghaf and Dubai South, features approximately twice as much greenery as it does buildings, in the form of parks, walking trails, landscaped terraces in apartment complexes and large gardens attached to villa plots. You also have jogging tracks, cycling paths, community pools and in some developments, golf courses and urban beaches. The basic idea behind this is simple – take some of the best natural attractions a city can offer and put them together in one place so residents can access them easily. After all, accessibility and infrastructure are two of the key pillars that these communities are built on. But on a larger scale these new developments are about more than convenience or aesthetic design or any of the qualities that I would normally describe from a real estate perspective. They represent a vision of Dubai where the concrete and glass towers of Sheikh Zayed Road are contrasted by an oasis of greenery along the city’s former outskirts. It is a vision where growth and expansion don’t come at the expense of peace of mind.